The Pathfinder Combat Pad is the ultimate tool for managing combat in any of your favourite roleplaying games. This magnetized board works with included magnets to easily track initiative. 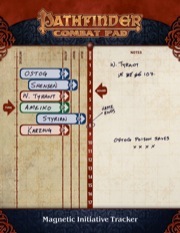 Its special wet- and dry-erasable surface allows you to customize the Pathfinder Combat Pad with your party�s information. With turn markers and guides for the ready and delay actions, the Combat Pad puts combat management at your fingertips. Need more magnets? Check out the Extra Magnet Pack!